Adam "Pacman" Jones will likely be fined for slamming Amari Cooper's head into his helmet Sunday but not suspended, sources tell ESPN's Adam Schefter. The incident will be reviewed by the NFL as part of its normal review process. The Cincinnati Bengals' cornerback told ESPN that he wasn't expecting a punishment to come following his involvement in the controversial playfeaturing offsetting penalties. Asked if he anticipated a fine or suspension, he simply replied: "No." Although officials clearly missed it, cameras caught Jones on top of Cooper, the Oakland Raiders' top draft pick, slapping at the wide receiver's helmet hard enough that it came off. As soon as it did, Jones grabbed Cooper's head and slammed it once into the helmet while Cooper was on his back underneath the veteran corner. "Whatever you saw happen, that's what happened," Jones said. "I'm just here to play football. I don't back down from anybody and I'm not out here trying to start anything. I'm just out here playing football." Cooper said he thought if officials had seen the play occur, they would have enacted a harsher penalty, such as ejecting Jones. Overall, though, he said he wasn't bothered by the play. "I mean, it's football," Cooper said. "It's a physical game, so you kind of expect it." ESPN.com's Coley Harvey contributed to this report. Should Pacman Jones be suspended? 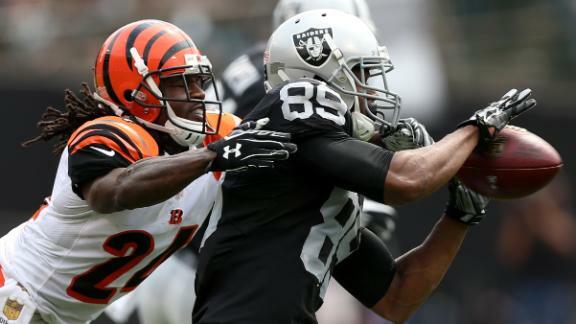 ESPN's Herm Edwards and Tom Waddle join Mike & Mike to discuss whether Cincinnati Bengals CB Adam "Pacman" Jones should be suspended for ripping Oakland Raiders WR Amari Cooper's helmet off then slamming Cooper's head onto the helmet.